Rescue Coordination Center Norfolk received a satellite emergency distress notification Monday night. Later that evening, an Air Station Elizabeth City HC-130 Hercules airplane crew located the 55-foot Beneteau Oceanis sailboat and contacted the crew by radio. The men did not report any injuries, but the boat's mast was broken and the steering gear was damaged. The Coast Guard Cutter Escanaba reached them Tuesday and the cutter's crew assessed the damage and rendered assistance. They took the four men aboard and headed back toward North Carolina. 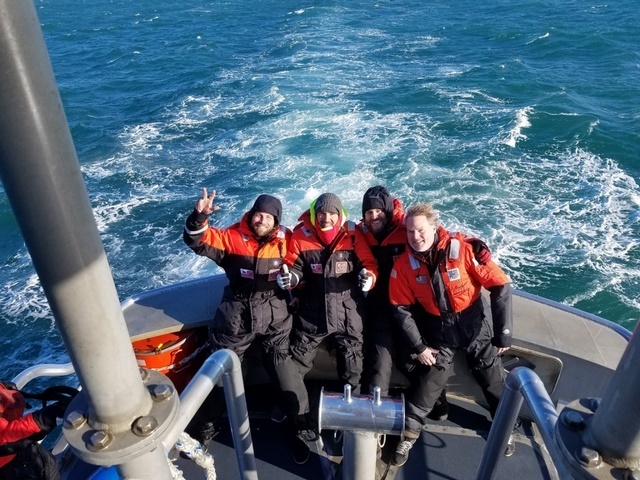 "I am extremely proud of the professionalism and performance of the entire crew of Escanaba, to safely locate and rescue these four mariners," said Capt. Michael Turdo, the commanding officer of the Escanaba. "With the on scene weather continuing to deteriorate throughout the day, this could have quickly taken a turn for the worse." Wednesday morning, a Coast Guard Station Fort Macon 47-foot Motor Lifeboat crew headed out to meet the Escanaba and bring the four men back to shore. The crew of the Beneteau sailboat had departed Annapolis, Maryland, on Saturday and were headed to Miami to deliver the boat when they encountered heavy wind and seas. The owner of the boat is coordinating salvage of the vessel.